Download "COMMERCE MENTORSHIP PROGRAM COMM295: MANAGERIAL ECONOMICS FINAL EXAM REVIEW SOLUTION KEY"
4 Skip work: no chance of getting bonus = 0 - (-3) = 3 Good effort: 0.4*(18-15) - 5 = -3.8 Overtime: 0.4*(25-15) - 10 = =6 Employees will choose to skip work b) If shareholders can choose the pay structure, what structure will they select? Shareholders will want to maximize the profit of the firm Fixed wage: 12*0.4-6* = -1.6 Revenue share: (12*0.4-6*0.6) - 0.7(12*0.4-6*0.6) = 2.52 Bonus: 12*0.4-6*0.6-0 = 8.4 Shareholders would choose the bonus because that would maximize profits c) If the employee s direct manager can choose, what structure will they select? Managers may want to maximize revenues instead of profits for the firm. Assuming this is the case, since under each pay structure, the employees will choose to skip work, the expected revenue would be the same in every case. Direct managers will be indifferent between compensation options. WR4 The market for bottled water can be considered competitive. The market demand for bottled water can be expressed in the form of P = 300-2Q. Marginal cost of producing a bottle of water is constant at 4. a) List several properties of a competitive market. 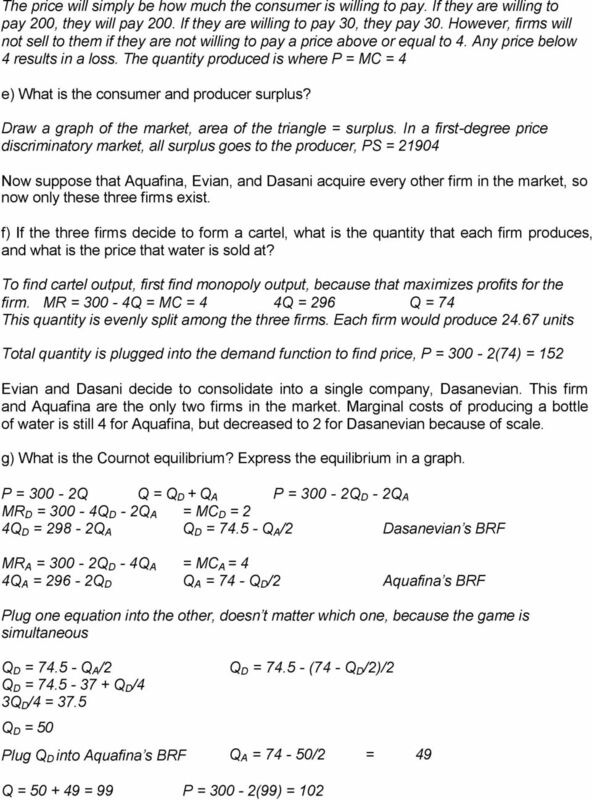 Competitive markets have many sellers, selling identical or similar goods, without any market power to set the price (price takers) b) What is the equilibrium price and quantity? 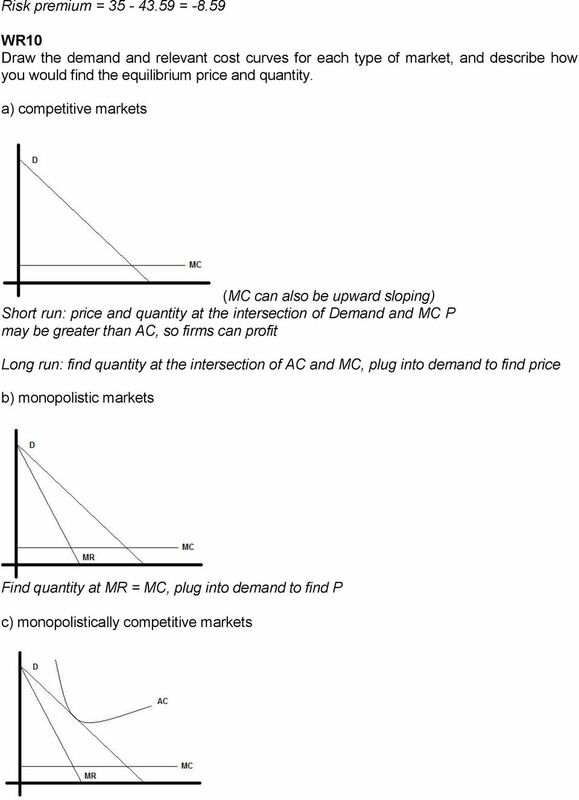 Competitive markets will produce where MR = P = MC, so P = 300-2Q = 4 2Q = 296 Q = 148 P = MC = 4 c) What is the consumer and producer surplus? Is there dead-weight loss? 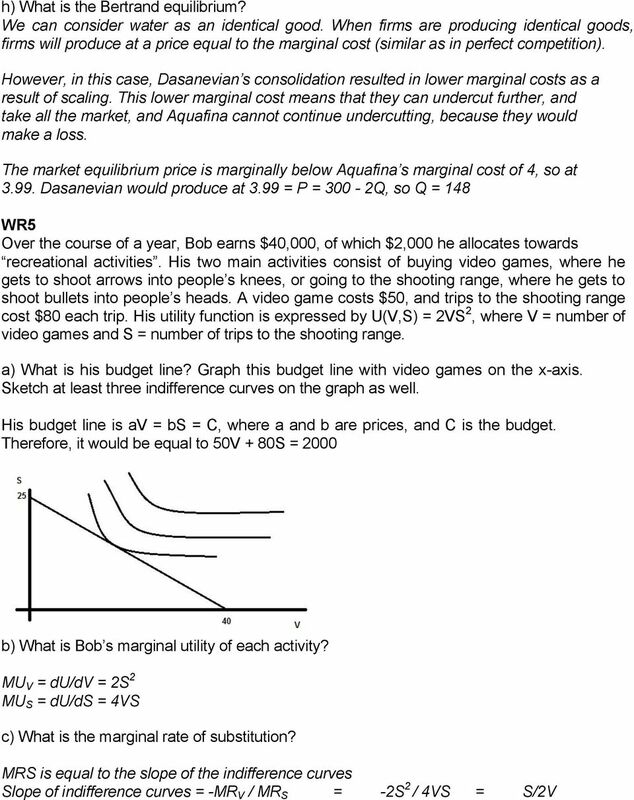 Draw a graph of the market, area of triangle = surplus. In a competitive market, all surplus goes to the consumer and there is no dead-weight loss, CS = 148*(300-4)/2 = Now suppose that Aquafina has market power, and decides to undergo first-degree price discrimination. 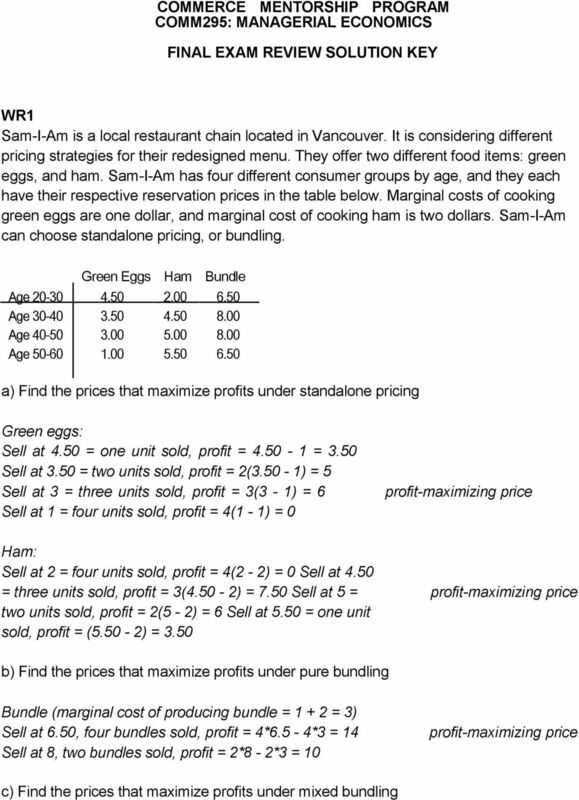 d) What is the equilibrium price and quantity? 10 Pepsi is considering making a direct payment to Coca-Cola to ensure that Coca-Cola will not invest in research. c) What is the maximum that Pepsi will be willing to pay? 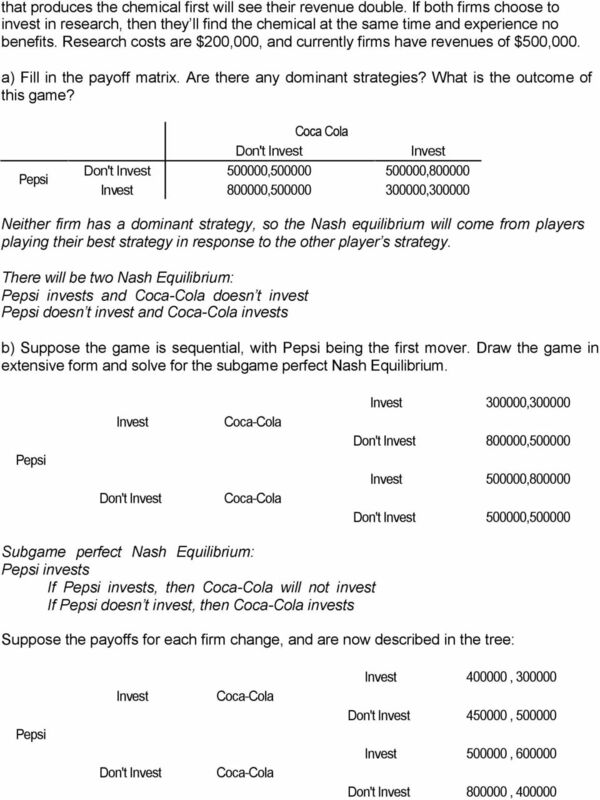 Pepsi would be willing to give a maximum of 800, ,000 = 300,000, because that is the difference in payoffs between if Coca-Cola invests and if they don t invest. If Pepsi has to pay any amount larger than 300,000, then they would just rather let CocaCola invest because then their payoffs would be higher if Pepsi doesn t invest and Coca-Cola invests. 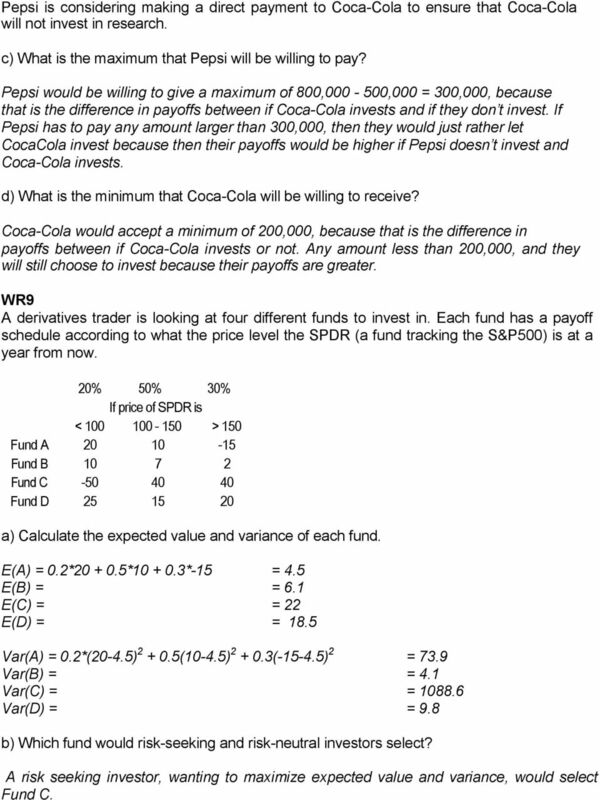 d) What is the minimum that Coca-Cola will be willing to receive? Coca-Cola would accept a minimum of 200,000, because that is the difference in payoffs between if Coca-Cola invests or not. Any amount less than 200,000, and they will still choose to invest because their payoffs are greater. WR9 A derivatives trader is looking at four different funds to invest in. Each fund has a payoff schedule according to what the price level the SPDR (a fund tracking the S&P500) is at a year from now. 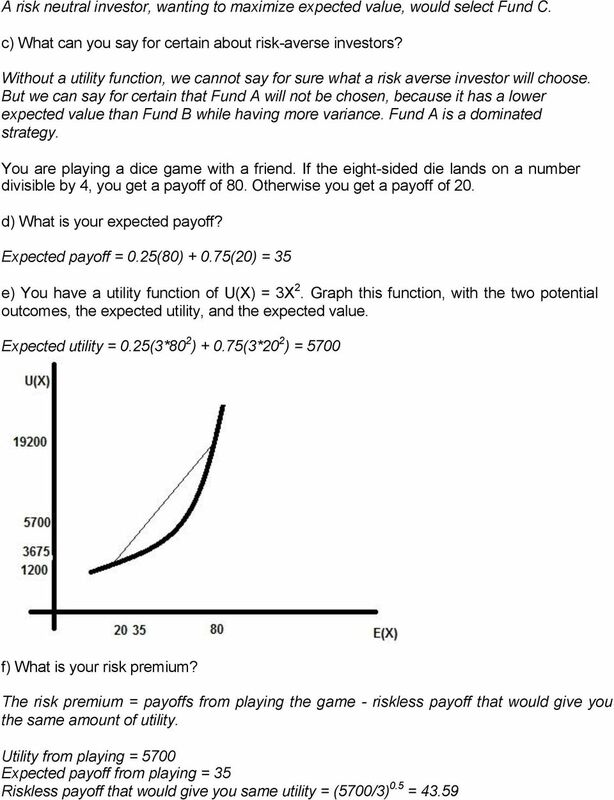 20% 50% 30% If price of SPDR is < > 150 Fund A Fund B Fund C Fund D a) Calculate the expected value and variance of each fund. E(A) = 0.2* * *-15 = 4.5 E(B) = = 6.1 E(C) = = 22 E(D) = = 18.5 Var(A) = 0.2*(20-4.5) (10-4.5) ( ) 2 = 73.9 Var(B) = = 4.1 Var(C) = = Var(D) = = 9.8 b) Which fund would risk-seeking and risk-neutral investors select? 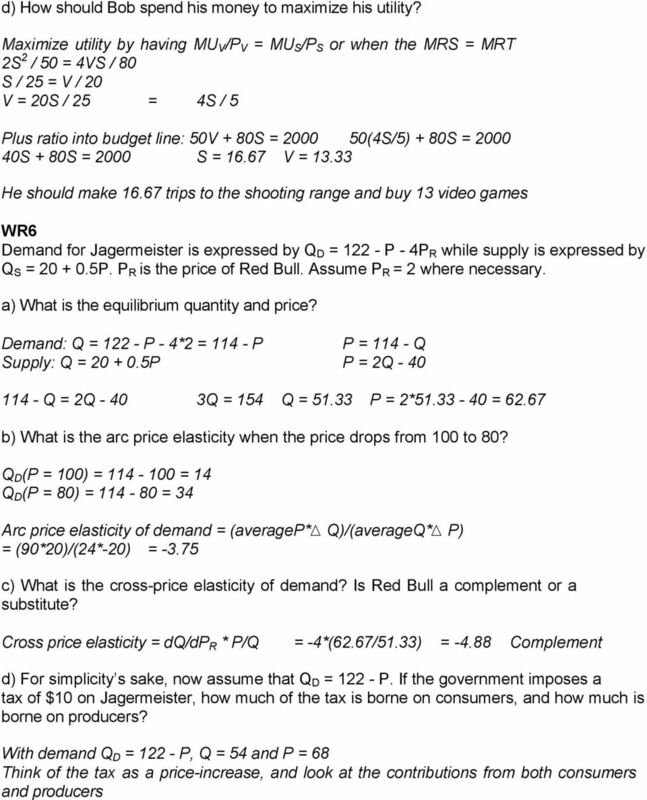 A risk seeking investor, wanting to maximize expected value and variance, would select Fund C.
13 Find quantity at MR = MC, find P = AC d) markets with peak and off-peak periods For each period, find quantity at the intersection of MC and MR, plug into demand to find price. Economics 101 Spring 2011 Homework #6 Due 5/3/11 Directions: The homework will be collected in a box before the lecture. Please place your name, TA name and section number on top of the homework (legibly). 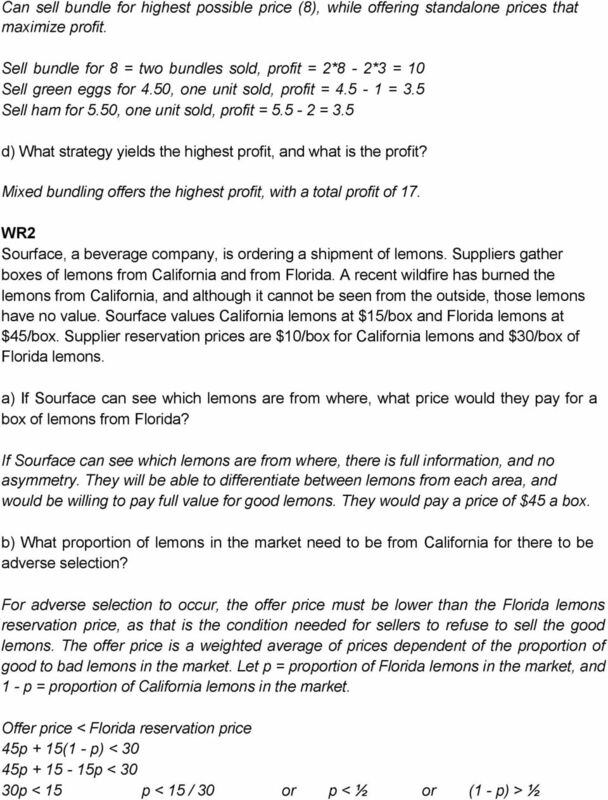 Matching E Multiple Choice d. a & b a. Identifying different types of customers and avoiding arbitrage by customers c.
Midterm 2 (40 points total) (A) (2 points) Define exogenous barriers to entry. Give an example.